In this paper, we reported 15 complete plastid genomes from 12 species of Holcoglossum and 1 species of Vanda. Background: The plastid is a semiautonomous organelle with its own genome. Plastid genomes have been widely used as models for studying phylogeny, speciation and adaptive evolution. However, most studies focus on comparisons of plastid genome evolution at high taxonomic levels, and comparative studies of the process of plastome evolution at the infrageneric or intraspecific level remain elusive. Holcoglossum is a small genus of Orchidaceae, consisting of approximately 20 species of recent radiation. This made it an ideal group to explore the plastome mutation mode at the infrageneric or intraspecific level. Results: In this paper, we reported 15 complete plastid genomes from 12 species of Holcoglossum and 1 species of Vanda. The plastid genomes of Holcoglossum have a total length range between 145kb and 148 kb, encoding a set of 102 genes. The whole set of ndh-gene families in Holcoglossum have been truncated or pseudogenized. Hairpin inversion in the coding region of the plastid gene ycf2 has been found. Conclusions: Using a comprehensive comparative plastome analysis, we found that all the indels between different individuals of the same species resulted from the copy number variation of the short repeat sequence, which may be caused by replication slippage. Annotation of tandem repeats shows that the variation introduced by tandem repeats is widespread in plastid genomes. 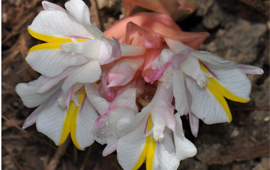 The hairpin inversion found in the plastid gene ycf2 occurred randomly in the Orchidaceae.